Toni Cipriani answering a public phone and finding a relieved Salvatore Leone on the other end. 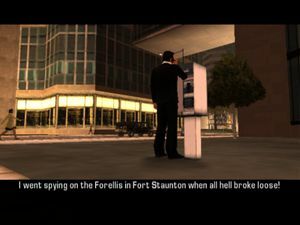 Search and Rescue is a mission in Grand Theft Auto: Liberty City Stories given to protagonist Toni Cipriani by Salvatore Leone from a public phone in Torrington, Staunton Island, Liberty City. Toni answers the public phone in Torrington, with Salvatore explaining that whilst he was spying on the Forellis in Fort Staunton, the Sindaccos attacked them and he's now in the middle of the action. Toni, on Salvatore's instructions, drives to the multistory carpark in Newport to pick up a bulletproof Stretch and drives to Fort Staunton. He exits the limo and kills numerous Forelli and Sindacco family mobsters, before finding Salvatore. The pair escape, killing more Forelli and Sindacco Family mobsters. Toni drives the bulletproof limousine back to Salvatore's place in Newport. Salvatore Leone: Thank God you picked up. Toni Cipriani: What's up, Sal? Salvatore Leone: I went spying on the Forelli's in Fort Staunton when all hell broke loose! The Sindaccos have gone to war with the Forellis, and I'm stuck here in the middle of a hit! Toni Cipriani: I'll be right there. Salvatore Leone: Bring my limo, it's bullet proof. We're gonna need it! Salvatore Leone: Toni, let's get outta here! Get me back to my limo! Salvatore Leone: OK, I got a place in Newport. Take me there! Salvatore Leone: Hey Toni thanks, I'll be in touch. Salvatore Leone: Toni? It's Sal. Get to the public phone booth at Liberty Campus. This is important. The reward for completing the mission is $2,000 and unlocks the mission Taking the Peace for Salvatore Leone. Toni Cipriani entering Salvatore Leone's bullet proof limousine. Toni Cipriani driving Salvatore Leone's bullet proof limousine to Fort Staunton. Toni Cipriani shooting Forelli Family mobsters in Fort Stauntonduring an attack by the Sindacco Family. Toni Cipriani finding Salvatore Leone in a small alleyway in Fort Staunton. Toni Cipriani killing an attacking mobster as he and Salvatore Leone make their way back to Salvatore's bullet proof limousine. Toni Cipriani driving Salvatore Leone's bullet proof limousineaway from the hit in Fort Staunton while under a 3-star wanted level from the LCPD. A relieved Salvatore Leone telling Toni Cipriani that he'll be in touch later. This page was last modified on 12 May 2015, at 23:31.